Plywood has always been a favourite material for home builders. Unfortunately plywood has not always enjoyed a good reputation. Poor quality vessels have been launched by builders who did not have a good understanding of required techniques, or chose to ignore them. At the same time, however, many fine vessels have been built to high standards, with excellent results. Bray Yacht Design. 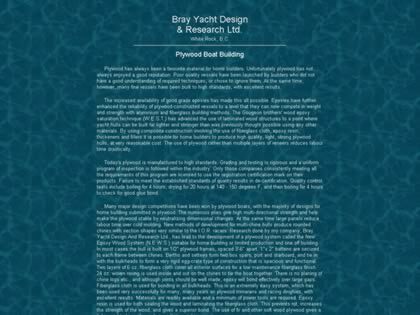 Web Site Snapshot: If available, above is a snapshot of the Plywood Boat Building web site at http://www.brayyachtdesign.bc.ca/article_plywood.html as it appeared when this site was added to the directory or last verified. Please Note that Boat Design Net has no involvement with the above web site; all content and images depicted in the above thumbnail are the property and copyright of Plywood Boat Building unless otherwise noted on that site. Description: Plywood has always been a favourite material for home builders. Unfortunately plywood has not always enjoyed a good reputation. Poor quality vessels have been launched by builders who did not have a good understanding of required techniques, or chose to ignore them. At the same time, however, many fine vessels have been built to high standards, with excellent results. Bray Yacht Design.